I’ve just reviewed a novel set in Latin America, Daniel Finn’s Two Good Thieves. The book is set in an unnamed country, not quite Brazil or Argentina or Venezuela or Mexico, but a mixture of them all. Mal Peet has done the same thing with his Paul Faustino novels, Penalty, Keeper and Exposure. I wonder whether Latin American writers are producing their own children’s books set in their own countries. If so, when will they be translated into English? 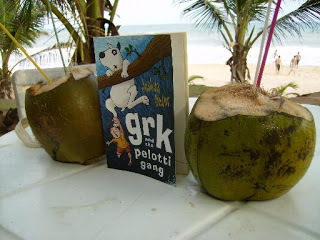 To brush away those wintery blues, here is a picture of Grk nestling between two coconuts on a Brazilian beach named Imbassaí. Many thanks to Nigel for the photo. I went to Belfast last week and took part in the kids lit quiz, which was a fabulous occasion, hosted by Wellington College and compered by Wayne Mills, the energetic New Zealander who created the quiz and now darts around the globe from his home in Auckland to heats in far-flung countries, wearing his inimitable hat. I was baffled by most of the questions. (I can’t remember many, but Wayne has posted some previous questions on his website.) Luckily, I was on a team with Tanja Jennings, the librarian at Wellington, who has an astonishing knowledge of children’s books past and present. In the end, a nerve-racking tiebreak was won by Wellington, who will travel to England to participate in the final in Oxford on 27th November. After the quiz, I stayed in Belfast for a couple more days and went to four more schools – Thompson, Kells & Connor, St Paul’s and St Bernard’s – many thanks to everyone who organised the visits and came along to hear me speak.